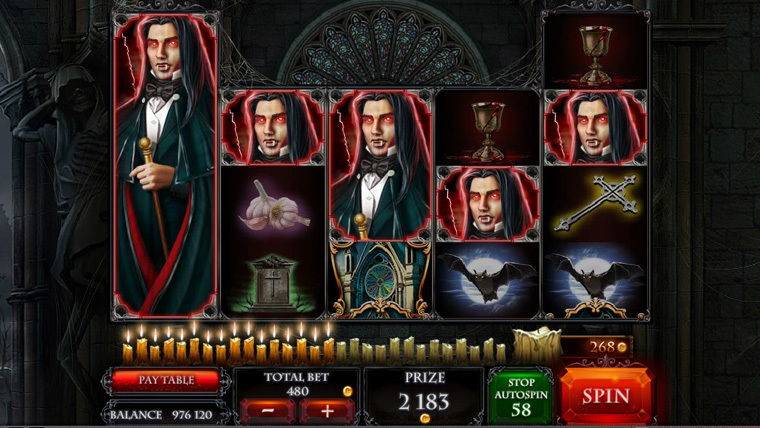 Crypt of the Vampires is an epic online video slot by Red Rake Gaming that has a 4x3x3x3x4 grid and 432 modes. If you’re looking for a ton of bonus features that can really spice things up for you then this game is a serious contender. With 95.48% RTP, great dark graphics as well as several bonus features, this video slot is a must-play. Vampire Attack – when a vampire appears expanded on the first reel the attack of the vampire function will be triggered. That vampire will make all the other vampires on the reels the same as him. Blood Thirsty – this feature can be activated randomly on any spin. Random positions on the second, third, fourth and fifth reels can be replaced by wilds. You can get between one and eight wilds on any spin. The wild replaces every icon except for the bonus symbol and the candle. Free spins phase for the coffins – if you land candles on any spin they will be added to the bottom of the screen. Once you have all of them you will enter the free spin phase for the coffins. With every candle you’ve accumulated a jackpot and that will be the bet you use to play the free spins. You will then select a coffin to play the free spins phase with. Inside there can be one of four vampires. Gabriel will award 18 free spins, Elizabeth grants 16, Oliver has 14 for you, while Sophie will give you 12 free spins. During the free spins phase all the vampires on the reels will transform into the vampire you got when you opened the coffin. Crypt Wheel Bonus – when you land three bonus symbols you activate the Crypt Wheel Bonus. the bonus on the third reel will indicate the initial number of spins on the wheel. The prizes can be coins, extra spins of the wheel, multipliers, level increasers and skulls. If you’re craving some blood and bonus filled games, then you need to try this video slot at least once!